My answer to that question was simple: neither. GitHub, instead, is the shape of things to come. Mikeal Rogers came to a similar conclusion in Apache Considered Harmful. His arguments copncerning the importance of GitHub are compelling, as the evidence in favor of decentralized version control generally and Git/GitHub specifically is overwhelming. 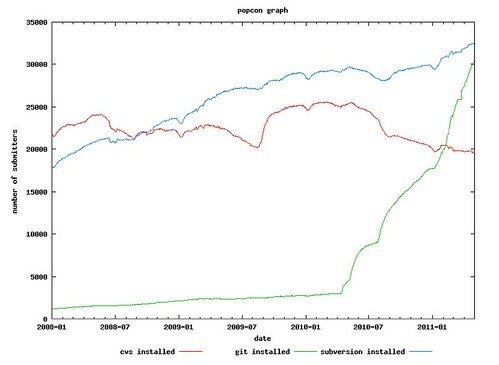 Quantitatively, virtually all of the metrics available to us reflect trajectories similar to those reflecting the relative popularity amongst Debian installations depicted above. As Chris Aniszczyk documents, legacy centralized tools reflect volume usage but Git’s massive growth has it poised to eclipse them. Git based services, meanwhile, are both profiting from and fueling said growth; an analysis of first half commit data for four major forges collected by Black Duck indicates that GitHub has in three years become the most popular open source repository. Qualititatively, the benefits to decentralized development have been apparent to us since at least 2007. What GitHub calls “social coding” is the ability of decentralized version control tools like Git or Mercurial to inject collaborative development into a previously individual practice. The byproduct of which is the parellelization of development; like bacteria, GitHub developers may now evolve by swapping material directly to and from one another as required coverage. Which means, in turn, that forking is no longer a bad word but the way development should be done. In the face of GitHub’s ascendance, the implications for open source foundations are unclear. In Apache Considered Harmful, Rogers’ argues that Apache specifically has essentially outlived its usefulness. But while I also subscribe to Clay Shirky’s maxim that “Institutions will try to preserve the problem to which they are the solution,” it is far from clear that it applies in this case. For disclosure purposes, I’ll note here that we count both GitHub and open source foundations like Apache and Eclipse as clients. The argument that foundations have become vestigial in a post-GitHub world necessarily focuses on functional overlaps. Historically, project hosting has been one of the services offered by foundations. The data suggests that foundations who reject decentralized version control systems will fall behind, which is why structures like Eclipse are implementing Git. Even assuming a given foundation is able to transition from centralized to decentralized mechanisms, however, there is no guarantee that this will be sufficient. Iit’s unrealistic expect any foundation to compete with GitHub on functionality or community size, given the respective areas of focus. The value of foundations, however, has never been principally hosting. They are, rather, the manifestation of a particular mission. The Free Software Foundation, the Apache Software Foundation, the Eclipse Foundation: all serve as the focal point for a group of developers. It is possible that their respective purposes have been fulfilled by GitHub, but the surging code repository seems likely to make foundations more relevant, rather than less. Apache was founded about 12 years ago, a time when companies were still very afraid of open source and many people in the open source community were very afraid of companies. The world hasn’t changed that tremendously, big companies still use an open source stamp as a marketing tool, commonly referred to as “open washing”, and some in the enterprise are still wary about open source, particularly when it comes to certain kinds of licensing. But, you would be hard pressed to find a single company that didn’t use some amount of open source software nowadays. The obvious implication is that as acceptance of mainstream open source increases the importance and relevance of Apache’s mission decreases. I believe this to be incorrect. Aside from the many important non-infrastructure services offered by foundations – including IP management, project governance, legal counsel, event planning, and predictable release schedules – foundations have value as brands. As the volume of open source assets grows, the paradox of choice presents itself to users. This problem in part already sustains a sizable marketplace of commercial products from vendors such as Black Duck, Open Logic, Palamida, and Sonatype. With GitHub and similar tools reducing the friction associated with development, we are likely to see selection problems get worse rather than better; as the volume of open source rises, fueled in part by GitHub’s success, so too does the difficulty of making a choice. Which is one reason foundations are important. Much as McKinsey advantages Baker and Rhodes scholars in their hiring process, certain audiences will prefer to leverage open source software associated with a known brand such as Apache or Eclipse. GitHub, Inc. (“GitHub”) supports the protection of intellectual property and asks the users of the website GitHub.com to do the same. It is the policy of GitHub to respond to all notices of alleged copyright infringement. Notice is specifically given that GitHub is not responsible for the content on other websites that any user may find or access when using GitHub.com. GitHub, in other words, disavows responsibility for the projects hosted on the site. Foundations, conversely, explicitly assume it, hence their typically strict IP policies. These exclusive models offer a filter to volume inclusive models such as GitHub’s. Rogers appears to have legitimate concerns concerning Apache’s acceptance of Git, and I concur that it’s a GitHub world and we’re all living in it. But I find it difficult to build the case that foundations more broadly won’t have a role to play in it. More and more, the “Apache brand” is one that serves as a warning label for me, not a safe harbor. Quality runs the gamut across Apache-managed projects, from the sublime to the shoddy. Insofar as Apache seems to be the dumping ground for all sorts of projects (how many web frameworks need to be under its umbrella? Which bits has Adobe sloughed off to Apache this week? ), any connotations of quality that may have applied in the past is fundamentally behind us IMO. The old saying about CA, “where software goes to die”, could be applied to Apache in many instances…”where open source software goes to die”. @sogrady, I think it’s the perception of IP cleanliness, not quality that’s important. While many individual developers are comfortable easily sharing software using FOSS licenses as social contracts, most corporate organizations live in a [rightly] more conservative legal climate and need the assurances of a well documented and understood IP process before they will assume the risk of use and participation. As an aside the git project itself is a member of the Software Freedom Conservancy, which provides a function much like the Apache Foundation to a collection of projects. Great post. To me, it sounds remarkably parallel to Communism. The idea works until a specific group takes charge and decides it knows what is best for the people, which inevitably leads to self-serving decisions. However while I agree that forking is healthy, I also believe it is anathema to standardization. So to achieve standardization and avoid the exact problems you talk about with Android (http://redmonk.com/sogrady/2011/11/02/android-concerns/), I believe some type of governance is needed. I wonder if the model will eventually migrate to a democratic model (one where developers vote in a governing body). Apache has a Maven plugin called RAT. It’s one purpose is to detect files without an Apache license and to fail the build if any are detected. Apache has a review board, where patches’ ownership is supposed to be handed over to Apache. 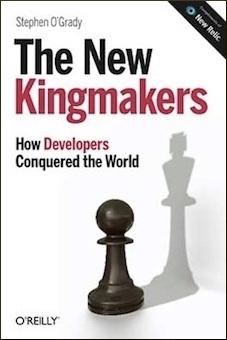 It used to be that this kind of institutional ownership was used to try to make corporations feel more comfortable about using open source software, that the Apache pennon indicated certainty & confidence and that businesses craved this. This has changed, the need for this reassurance. The decentralized model indeed sprung up from that weakening, but what prompted that attitude change? For one, open source is everywhere and we no longer regard it as alien. I’d wager 98% of people who have written code at least three times in their life have used some kind of open source code or development tool, and that 98% of software companies have at least one open source component they rely on directly or indirectly. Organizations have to opt out of open-source, and that’s much harder to do than it used to be. Three, the programmers run the show. Not only is open source just a part of making software, but there are less business managers telling programmers how to code and what tools they need to use to do it. There are a lot more libraries than there were a decade ago, and the businesses have gotten further removed from deciding how to pick. Four, everyone feel like IP is a primeval jungle out there, one where full and new moons have frenzied lawyers gripping knives between their teeth running through the jungle attacking at random. It’s all arbitrary, so why bother fretting over the face that there is no LICENSE file for the github code you’re staring at: of all the threads, joe and his weekend project are probably not gonna be the ones bringing out the elite IP attack squad to make that jungle a nightmare for you. Decentralized seems somewhat synonymous with zero friction do-what-thou-wilt practice. It’s the realization of this liberty that makes brands important, to provide guidance across an increasingly expanding and potentiated space. That’s not just so you the programmer don’t get fired, that’s so you the programmer don’t have to expend a sizable fraction of your life constantly evaluating the ever changing technical ecosystem: the brand will percolate ideas up to you. Little last word on this, if Apache does want to maintain a presence as a reliable base for developers, quite a few Apache project wikis need a lot more authoritative and prescriptive content on building and running Apache powered systems. Apache has more commercial contributions than it used to and the danger is Apache allowing commercial entities to sell Apache-ified code while keeping the project structure and support out of Apache. Apache the brand needs a lot more than just code to serve needy app developers.